NextRare Byzantine grape seeds found in Israel has given us hope of a new Negev wine? Past and Present: The Grand Place, Mons, Belgium. The Belgian site of Mons has a long and illustrious past going back to Neolithic times. The Romans under Julius Caesar were there by the 1st Century BC, where he built the first Roman military buildings. By the twelve century, Mons became a fortified city and its population grew quickly under its protection. Trade prospered and many marvelous commercial buildings were constructed near what is known as the Grand Place. In the nineteenth century, the fortifications were dismantled allowing for the city to expand and grow beyond the old town. 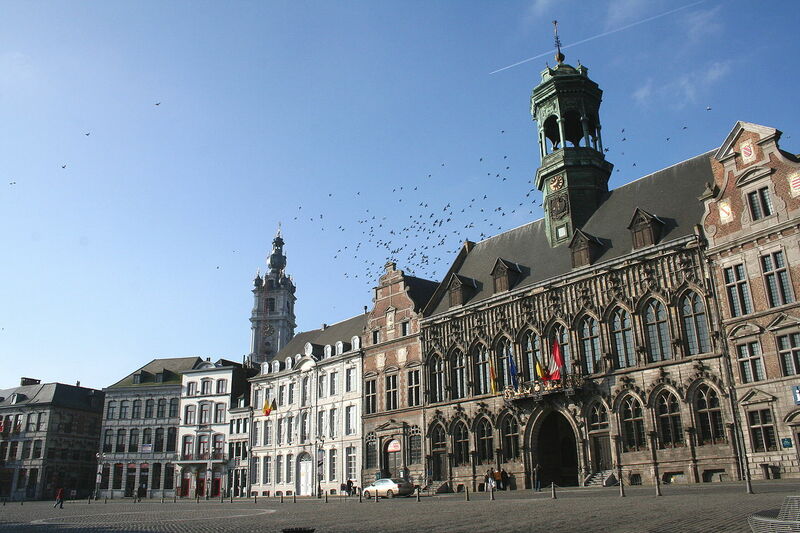 In the centre of the historic old town lies the Grand Place, which is often referred to as the beating heart of Mons. The magnificent City Hall dominates the central square of the Grand Place and has so since the thirteenth century. It has been rebuilt and renovated over the centuries, but its façade has roughly looked the same for the past hundred years. One hundred years ago in 1914, Mons was surprisingly an urban battlefield, where two great powers, the British and Germans, collided during the first encounters of the First World War. After two stubborn days, the British were forced to retreat, making way for the Germans to capture Mons. It would be four long years before Mons was eventually liberated by the Canadian Corps. Today the square where the German army marched through in 1914, has no real reminders of the toll of German occupation during the First World War. The pavilion structure in the B&W picture is long gone, but the main square still retains its old charm. The square today is also home to many cafes and restaurants, as well as the Town Hall. The marvelous gothic style Town Hall building attracts visitors all year around. 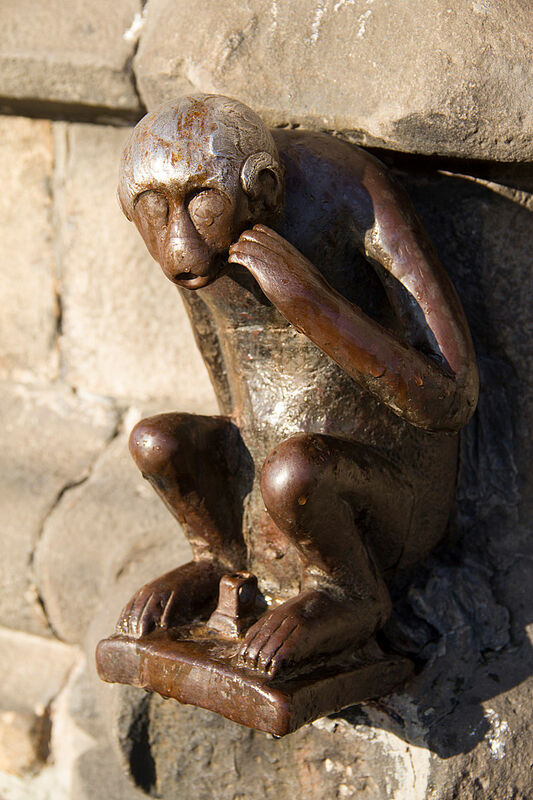 Often they come to touch the head of the small iron monkey statue that stands near the front entrance of the Town Hall. Apparently, when its head is touched, it is supposed to bring you good luck. The central square is also beautifully paved in the fashion of most old cities. Furthermore, unlike the marching German army of 1914, the centre square doesn’t allow cars to pass through it. It is protected for the exclusive use of pedestrians and markets. Photo Credit: The header image of German soldiers of the 18th Division, IXth Corps, in the Grand Place, Mons after the capture of the city in 1914 is courtesy of Imperial War Museum reference no. Q 70072 and used under their terms and conditions of fair dealing. The present day image of the Grand Place and town hall are used under the Creative Commons Attribution-ShareAlike 3.0 license. The iron statue of the Monkey is also used under the creative Commons Attribution 3.0 license. I loved the b/w photograph. I have never been to Mons, but it is very similar to Ypres, which must have been almost totally rebuilt since the conflict I suppose. It is quite Grand – even today! Can’t imagine what they must have thought of it back in the days of the original photo. Rare Byzantine grape seeds found in Israel has given us hope of a new Negev wine?